UPDATED: Sat., Sept. 16, 2017, 8:41 p.m.
With everyone asking how Washington State’s record-setting quarterback would bounce back from last week, Falk needed just half a game to give an emphatic answer. 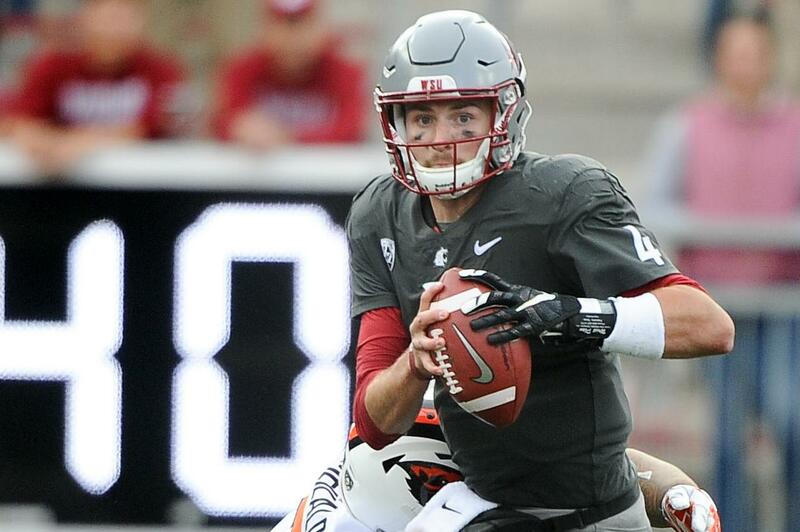 The Cougs led OSU 28-9 at halftime largely because Falk was 22 of 30 for 199 yards with four touchdowns. By game’s end, Falk was 37 of 49 for 396 yards with six scores. Early, often and when it mattered most, Martin was the key target for Falk. Martin opened the scoring with a 21-yard catch in the first quarter and gave the Cougs their first two-score lead late in the first half. His final play, a 57-yard catch-and-run, put WSU up 35-16 late in the third. Martin finished with 10 catches for 194 yards. Thompson, a sophomore safety, was all over the field against the Beavers. He had a team-high nine total tackles – including one for loss – plus a pass breakup and the Cougars shut down Oregon State when it mattered most. Published: Sept. 16, 2017, 8:38 p.m. Updated: Sept. 16, 2017, 8:41 p.m.